If the measure of a satisfying comedy is simply the laughs-per-minute ratio, Jackass Presents: Bad Grandpa is worth every penny. 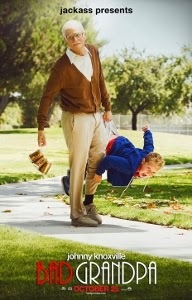 Johnny Knoxville stars as Irving Zisman, an 86-year-old widower on a mission to deliver his eight-year-old grandson, Billy (Jackson Nicoll), to his ne’er do well father. Bad Grandpa coasts along on this basic plot thread rather than the plot-free series of stunts seen in the Jackass movies. As advertised, the bystanders are real people with real reactions. In other words, it’s closer to Borat or Bruno, but without those films’ elements of social satire (exposing racism in the former, homophobia in the latter). That lack of depth and ambition does Bad Grandpa no harm in terms of eliciting laughs. Irving and Billy get up to all kinds of hijinks, including a disastrous funeral for Irving’s recently deceased wife (Catherine Keener), a flatulent visit to a diner, crashing a wedding, and attending a child beauty pageant (in which Billy poses as a girl). Many of the big set pieces were featured in the film’s trailer, most prominently the climactic pageant. This obviously hurts the element of surprise, especially if you’ve seen the trailer tons of times. But this isn’t a case of “all the best gags were in the trailer.” I don’t want to reveal too much, but suffice it to say that I can’t help but break out in giggles just thinking about Zisman’s appearance at a male strip show. I don’t know about you, but not many comedies can get me laughing simply by remembering it. Bad Grandpa is the kind of movie you just can’t wait to talk to your friends about, mutually cracking up as you recount favorite moments. Sure it’s shallow, silly, and arguably pointless – but so what? I would actually argue that Knoxville and his co-writers Spike Jonze and Jeff Tremaine (who also directed) had a very valid point: to leave people’s sides sore from laughter. My Thursday night screening was nearly sold out and the belly laughs were totally contagious, carrying over from one scene to the next. Following the aforementioned works of genius by Sacha Baron Cohen and the earlier Jackass movies and TV show, Bad Grandpa isn’t all that fresh or original. But what sets it apart is the surprising degree of tenderness that develops between Irving and Billy. Young Jackson Nicoll is truly sensational as Billy. His completely natural interactions with passersby (he tries to get one hapless dude to spontaneously adopt him) are among the film’s highlights. Some of Knoxville’s obviously unrehearsed reactions to Nicoll’s apparent improvisations are priceless. The bond that develops between Irving and Billy is at least as believable as seen in your average “heartwarming” comedy, maybe more so. Knoxville has such a knack for eliciting sympathy from strangers, even under the most outrageous of circumstances, you can’t help but root for Irving. By the time he and has grandson meet up with Billy’s father (at a biker bar populated with members of a real biker organization, Guardians of the Children), I was ready to watch the odyssey all over again. Honestly, what more can you ask from a comedy?